Holiday season is here again, and many of us will be going away for long vacations. While away, it might sometimes be important to remotely connect to your home or office computer. You might have to access some important office file, or check something on your home PC, or for any other reason. So, it would be a good idea to plan in advance to be able to remotely connect to your computer. Here are 5 Free Software that let you remotely connect to your computer. I have tried to include free remote connect software from all the categories, so you can remotely connect to your computer using installed application, or your browser, or your email, or even just with Twitter! Read on, and find which one is best for you. Note that in all the cases, you will have to complete setup for these before leaving for vacation, and will then have to leave your PC switched on over the vacation. LogMeIn Free is the free version of popular remote connection software LogMeIn. This is completely free with no strings attached. To use LogMeIN Free, you just need to install LogMeIN Free on the computer that you want to remotely connect to. After that, you can connect to that computer from anywhere by logging in to your LogMeIN Free account online. You don’t need to have LogMeIN Free installed on the computer that using which you are connecting to your remote computer. LogMeIN Free will show you desktop of your remote computer, and you can do any activity on that, include remote shutdown and reconnect. Only thing missing is that you cannot transfer files from your remote computer, but that is also possible by a small trick as explained here. TeamViewer is similar to LogMeIN Free. TeamViewer lets you connect to remote computer, and see your desktop and do any activity on that. You need to have TeamViewer installed on both the computers to use all the features. One big advantage of TeamViewer is that it has a built-in remote file transfer. So, you can easily transfer any file from your remote computer to your own computer. Read more here. Let me start by saying that this is one of the most innovative software I have ever come across. I could have never thought that Twitter could be used to remotely connect to my PC. 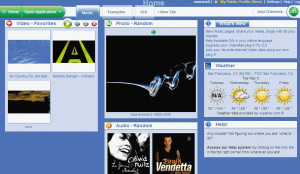 TweetMyPC is an interesting application that you need to install on the PC that you will want to remotely connect to. After that, you can remotely control your PC just using Twitter! By sending some simple Twitter commands, you can remotely get any file from your computer, get a screenshot of your remote computer, download any file to your remote computer, and even shutdown and restart your remote computer. All this using Twitter only. Love it! Read more here. 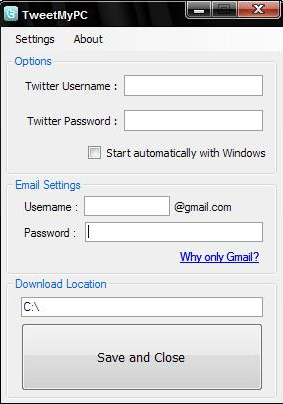 RemoteByMail works in a similar manner like TweetMyPC, but instead of Twitter, it lets you remotely access your computer using email. You need to install RemoteByMail client on the computer that you will need to remotely connect. After that, you can remotely access files of that computer by just sending email to a secure email address.It can even zip files before sending, and you can also execute some program on your remote computer with this. Orb is a free P2P software to share large files. This can be used to remotely access files from your computer by just logging into your online Orb account. You need to have Orb running on the computer that you want to remotely access. Then, whenever you need a file from that computer, just login to your Orb account, and Orb will transfer that file using P2P. Read more here. As I mentioned earlier, all of these software will need to be setup before you leave for your holidays. So, plan ahead, and do not leave anything to chance.